Economic census results out: 900 thousand industrial firms in country - Integration Through Media ....! Prakash Silwal, KATHMANDU: The number of industrial firms in the country stands at 922 thousand 445, according to the preliminary results of the First National Economic Census 2018. The Census conducted by the Central Bureau of Statistics (CBS) was launched here today. Three million 408 thousand 746 people are working in these industrial enterprises. Among them, 2 million 44 thousand 989 are male and one million 363 thousand 757 are female. It is found that two males and one female are working in a single industrial enterprise on average. The census included only the registered enterprises. On the basis of provinces, Province No 3 has 30.06 per cent industrial enterprises while the Karnali Province has only 6.0 per cent industrial enterprises. Looking at the district-wise location of the enterprises, there are more enterprises in the districts of the Tarai than the hilly districts. The highest number of industries (14 per cent) are in Kathmandu. Manang has the lowest number of industries at 487. 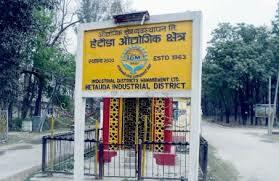 There are 8.06 per cent industries in Kathmandu Metropolitan City. After Kathmandu, Jhapa, Rupandehi, Morang, Sunsari, Kaski and Chitwan have higher number of industrial enterprises. This is the first economic survey of its kind in the country which includes economic data and information at the municipality and rural municipality level. The census was conducted nationwide from April 14 through June 14 and it includes the particulars of the economic units (goods and production) of all the business sector and firms. Among the 21 economic activities under international classification, the directly visible 18 activities have been covered by the census. These include ageiculture, forest, fishery, mine and mineral extraction, industrial production, electricity, gas, vapour-steam, supplies, water, sewerage, waste management, insurance, retail and wholesale business, education, information and communications and real estate business. Releasing the result, NPC member Dr Ram Kumar Phunyal said that a new step has been achieved in Nepal’s development, saying the details has prepared a basis of economic statistics. The NPC would use the details of economic census in upcoming 15th periodic plan along with development goals of socialism-oriented economy. Saying the details would be helpful in formulating and analyzing economic policy of federal Nepal, Director General of the Department, Suman Raj Aryal, said that Nepal has become successful for the first time to be enlisted in the list of the countries carrying out economic census. Minister Counselor, Deputy Head of Mission of Japanese Embassy in Nepal, Shinya Machina, expressed the belief that this has become a new basis and fruitful for foreign investment in Nepal.